With the vaping epidemic steadily taking up a lot of ink lately in the national news, HIPHI continues to fight back. Not with ink, but with something a lot more colorful: paint. On the heels of the statewide spring kickoff of the 808NOVAPE campaign in theatres, on social media platforms, on radio stations, and in shopping centers, HIPHI is now bringing its message to the walls of schools. Through a partnership with Keep It Flowing Media, the 808NOVAPE campaign will expand its vape prevention efforts from 12 public schools across the state to 18 with ‘Breathe Aloha’ murals being painted at six different schools in the 2018-2019 school year. As the new year approaches and the school year is reaching its halfway point, three such murals have already been produced and unveiled this past November at Baldwin High School on Maui, Kealakehe High School on the Big Island, and at Farrington High School on Oahu. While Hawai‘i maintains the third highest rate of high school students vaping in the nation, the 808NOVAPE campaign is consciously multiplying its efforts in order to bring that number down. The first ‘Breathe Aloha’ mural was unveiled on Monday, November 5, at Maui’s Baldwin High School as the first-period bell rang out and a handful of students from the school’s Hawaiian class began to bless the mural. The small crowd of students, school officials, coalition members, Maui Mayor Alan Arakawa, and others posed for photos before heading indoors for a Vaping 101 presentation that was scheduled for an assembly of 150 Baldwin High students. After the mayor read and presented the proclamation commemorating the mural, HIPHI Youth Council member and Baldwin sophomore Isabel Collier began speaking to the assembly about the toll of tobacco on today’s generation. HIPHI’s Maui County Coordinator, Katie Folio, and project coordinator, Kevin Ramirez, joined Isabel to present information on the emerging health hazards of vaping for youth and the power of countermarketing. HIPHI’s #808novape campaign breathes ALOHA onto a wall at Kealakehe High School. The second ‘Breathe Aloha’ mural was unveiled on Friday, November 16, at Kealakehe High School on the Big Island. Among the guests who attended the event were Hawai‘i County Councilmembers Maile David and Karen Eoff. #BreatheAloha comes to Farrington High School and leaves its mark. The third ‘Breathe Aloha’ was unveiled on Monday, November 26, at Farrington High School on Oahu. Among the guests who attended this event was Dennis Arakaki, Community Liason for Honolulu County Councilmember Joey Manahan and Chair of the Farrington High School Community Council. Although these mural unveiling events were over within a couple of hours, the beautiful murals and their messages, along with the hand-painted students’ affirmations, will continue to inspire and encourage current and future high school students at all three schools to ‘Breathe Aloha’ for many more years to come. 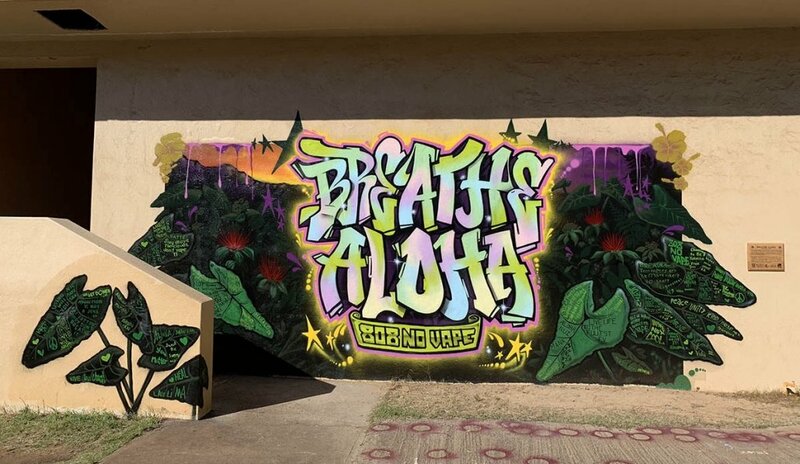 Three additional ‘Breathe Aloha’ murals are slated to be produced and painted at schools on Kaua‘i, the Big Island, and O‘ahu in the spring of 2019.